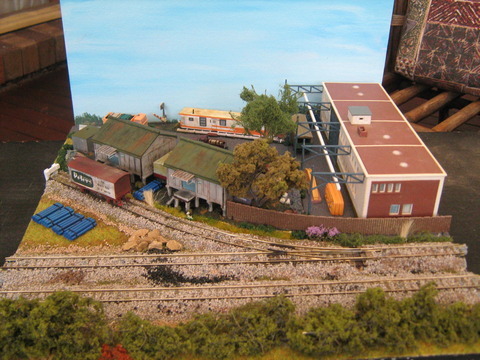 Description: I recently went to my local hobby shop and purchased a resin module of a goods shed. 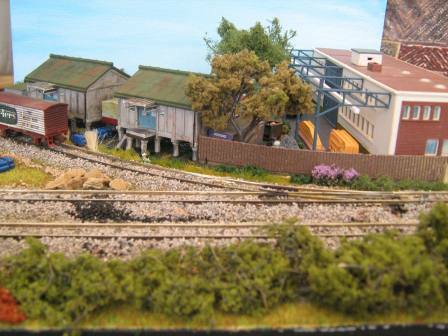 It was from the Hornby Lyddle End range. When I got home I realised that I had already purchase the identical model, so I decided that both could be used on the one module. I decided to use a very small radius Peco set track point. powered by a traditional peco solenoid motor and a digitrax stationary decoder. The module has a old art deco building with a scratch built gantry along the edge of the factory. I used lots of materials as surface detail to move the eye to different parts of the scene. There is a small Imex motor home at the rear, it really represents typical construction worksheds on modern Australian worksites. I have again moved back to using Euopean grass mat that is lined with paper. It's old fashioned, but it dresses up really well, with small details that are now available.